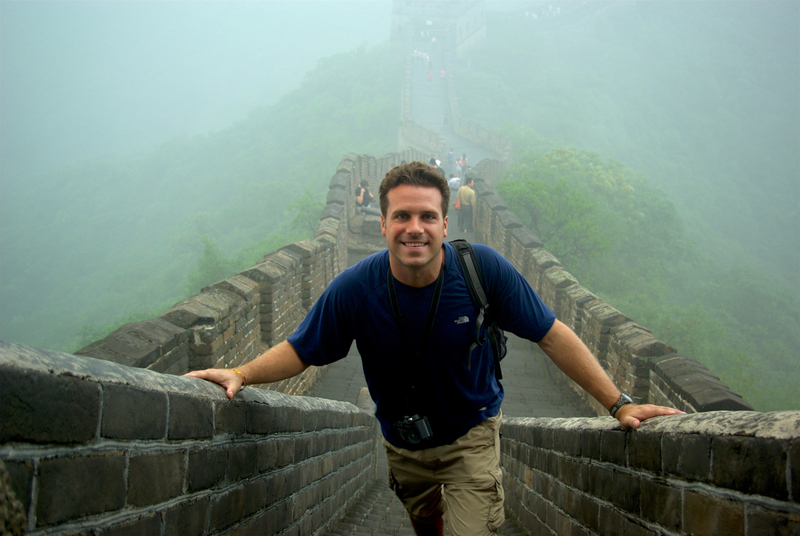 Being in Beijing, a trip to the Great Wall of China was a definite MUST. 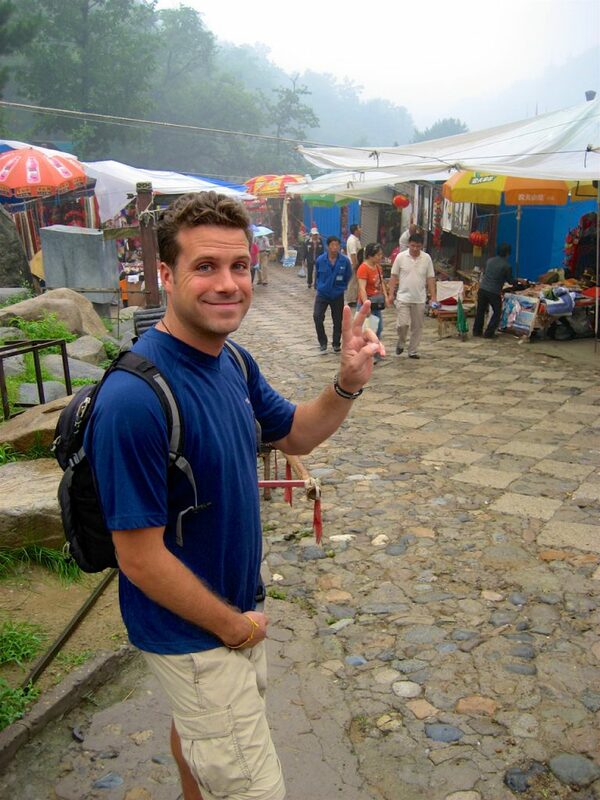 We had done a bit of research on the different options and were stuck in a debate about whether or not to go for a day-long hike along a part of the wall that was still left in ruins, or try a shorter trip that would take us out to a part of the wall that was still in good condition. The hike was definitely our favorite option- the problem was the weather. It had been overcast and foggy the whole time we had been in Beijing, with showers off and on, and we weren’t too keen on heading out for a day-long hike in the rain. We ended up opting for the shorter day trip, knowing that we could do the longer hike another day if the weather happened to clear up. We arrived at the site for our visit after a short drive out of Beijing, only to find ourselves dropped off in ‘Tout Central’- an area crammed full of souvenir shacks, t-shirt stands, and ‘professional’ tour guides trying to sell you their services. Our official guide for the day had warned us about the touts and the shady tour guides as best as he could in his severely limited English. He was HILARIOUS- asking us to teach him new words and help him perfect his pronunciation. I give him credit- he knew a LOT more English than I knew Chinese, and I’m well certain that I could never perfect my Mandarin pronunciation. Having navigated our way through the touts and their tents, we then started the long climb up to the actual wall. 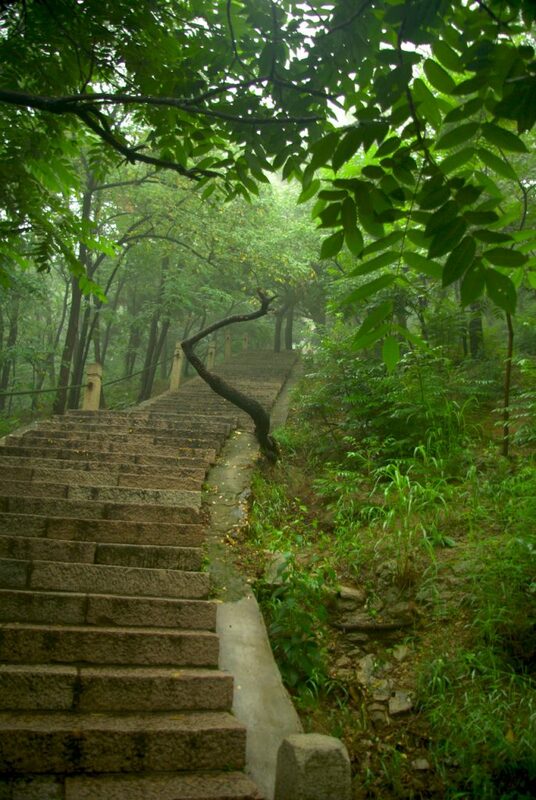 An earthen staircase wound up through the trees, eventually leading us to the stone stairs used to mount the wall. Sure enough, at the small entrance we passed through to gain access to the wall, there was a vendor selling bottled water for double what it was down in below. A simple smile and “No thanks”, and we were off to explore. Unfortunately, the weather had not changed since we left the hostel. If anything, the clouds seemed to be lower and thicker than they were in the city. 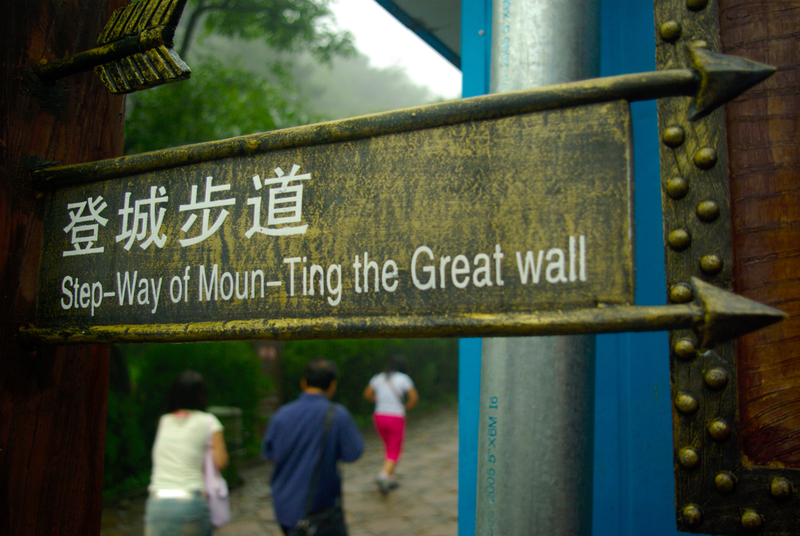 We realized immediately that we weren’t going to get any of those iconic photos of the Great Wall, winding its way along the hilltops, disappearing off into the distance. 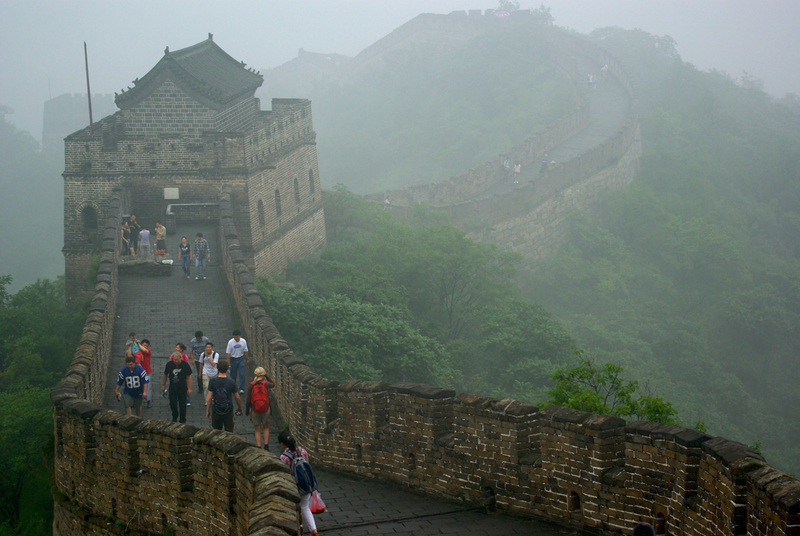 At most, we could see maybe a kilometer of the Wall before it disappeared into the shrouding mist. It was a bit disappointing, but as a traveler you learn to make the most of the situation, so we set about the business of documenting our visit. There were several other tourists up on the section of wall that we were visiting, all meandering about, trying to get some good photos despite the less than ideal conditions. Cory and I waited for groups to move on before we took our photos, trying to get them as people-free as possible. The wall itself was IMMENSE- it was really hard to wrap my brain around the idea of how old it was, how many people it took to build such a structure, and how long it would’ve taken those thousands to complete such a feat. Again, it was one of those situations where I wished I had a time-machine to go back and view the structure in its heyday. It was incredible to imagine ancient Chinese warriors monitoring the approaching hills from the imposing towers, soldiers marching up and down the wall, a constant presence against foreign invaders, and armies of Mongols and other invaders attempting to scale the wall and conquer the Emperor’s lands. There on the wall, amidst the groups of tourists and vendors, it was hard to picture it all as it was thousands of years ago. A tremendous feat of human engineering and accomplishment, for sure. We had limited time on the wall, as we had to get back to the van for the ride back into Beijing. We made the most of it though, getting all of our photos and videos taken at the beginning, allowing us to explore the stretch of the wall for the rest of our time. Despite the time constraints, despite the crowds, despite the mist and the grey and the fog, we had an awesome time. 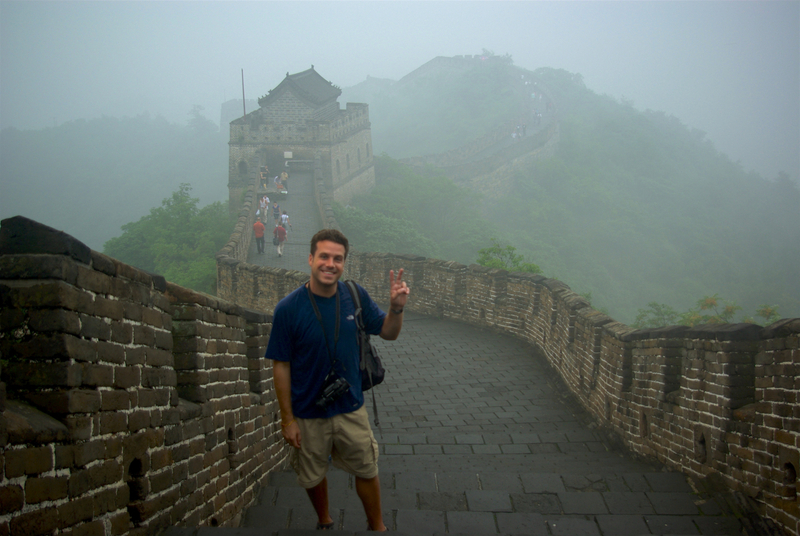 The Great Wall of China is incredible, not only for the unfathomable structure that it is, but also for the brief glimpse of ancient Chinese history it provides. Someday, I’ll go back and get that iconic photo.